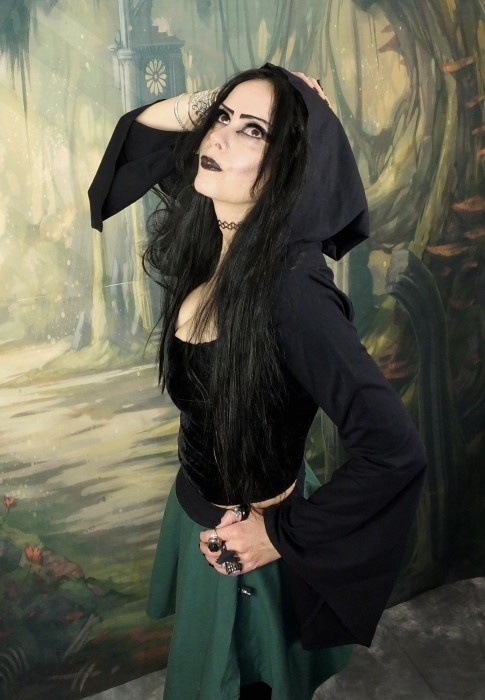 The ultimate way to add that elven-goth vibe to any outfit - here's our Eledhwen Bolero! <br> <br> Made from soft stretch cotton lycra, it's got a roomy, elven hood and gorgeous, swooshy sleeves - and is available in any of our cotton lycra shades, choose yours below - and as you can see, it's a perfect match for our Elven Huntress Miniskirt! The ultimate way to add that elven-goth vibe to any outfit - here's our Eledhwen Bolero! Made from soft stretch cotton lycra, it's got a roomy, elven hood and gorgeous, swooshy sleeves - and is available in any of our cotton lycra shades, choose yours below - and as you can see, it's a perfect match for our Elven Huntress Miniskirt!